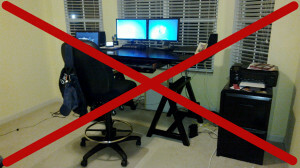 telecommuting | brian habbe | life .. It seems to be a regular occurrence these days for the power to go out. While it doesn’t happen every day or week it has a few times in the last 6 months. Today was one of those days and not a good day for it. About 10:00 this morning the laptops battery kicked in and then I heard a loud pop. The power was out. No point wasting time as I was in the middle of a few things I loaded up and was off to a cafe that had wifi about 10 minutes away. Unfortunately when I got there they did not have power either. I figured that meant power was out for 10 square miles from the house and I didn’t know of any other wifi spots close by. So it was decision time, wait it out or find a place to work. I opted for finding a place to work. I know of a Panera Bread about 30 minutes from the house so I headed that way. I was able to get some work done but after a couple hours I’d had enough of the slow connection and getting disconnected. It was back to the house and power was on by the blinking clocks the outage lasted for about and hour and a half. Hopefully it will be a while before the next one. I think I need to scout the area one of these weekends for a closer alternative if the one cafe is not an option. I began telecomuting in 2001 after a move Nashville, TN. At the time I was prepared to find something new or continue working at the same company. I’m glad to say I’m still employed there today, but it has not been without challenges. The last couple weeks have been more difficult but when you work from home, how can you really complain. So it must be that telecommuting has gone to my head !!! Performing day to day processes without the massive resources a few steps away takes a certain amount of imagination. But you have to keep in mind others don’t work this way. When most people have the opportunity of poping into a coworkers office or sitting in on a meeting working remote does not allow that type of interaction. Conference calls, net meetings, mail, and chat those are what we use to replace being there. None of them have that level of interaction where a personal touch can be conveyed. Oh and we know what a face to face meeting can do don’t we !!!! It is furstrating and challenging at the same time cause you get sucked in to “why can’t so and so see this”, “why do I have to wait hours for an answer to an email, if I was there it wouldn’t take that long”. But you have to remember not every body looks at it that way. Kind of like the acronym RTFM. Those that didn’t have another option, had to read it, learn from it, try it and apply it to know what happens. If the resouce is a a few feet away that’s a different story. So I think it’s time to sit back take inventory and get back to reality, deal with the fact that the telecommuting world is different… their’s no way around it. In April of 2001 I moved to TN and kept my job with a software Company in IL. I officially started telecommuting then and have done so since. So working remotely is almost old hat these days but over the weekend my cable went out. That left the house without TV and internet which would not be a big deal accept Comcast could not get there till Tuesday. So off to the local coffee shop I go to keep from falling behind. The tuff thing about that is for work I need to us WindowsÂ® and that is a desktop at the house. My laptop is Linux, Ubuntu, so that presents some unique challenges. Of course the only true problem, as I’ve commented in previous posts about using Linux with work, is with the call tracking software we use. The web front end is not enabled so no access from the outside. I can use VPNC to get in but would then need to remote access a pc. Of course none of this is old technology and I’ve done it before in a pinch but us remote workers are very few and I don’t blame IT for not wanting to cover some of our access problems. So I’ll struggle for a few days. I will say, knock on wood, Comcast has been very reliable in the five years I’ve used them… only a couple outages. This latest one just came at a bad time, with the weekend and MLK day falling after the outages.